HANCEVILLE, Ala.—More than 100 new scholarships will be available to Wallace State Community College students in the coming year as a result of a record-breaking fundraising event put on Wednesday by the Wallace State Future Foundation. The Future Foundation’s annual Student Investment Luncheon raised $166,396 from its silent and live auctions, scholarship contributions and table sales. Through a U.S. Department of Education Strengthening Institutions grant that provides a perfect endowment match, dollar for dollar, the actual funds raised this year went twice as far. Wallace State Future Foundation President Fred Cespedes said he was thrilled to see such a large crowd in spite of the dreary weather. Attendance was double that of last year. 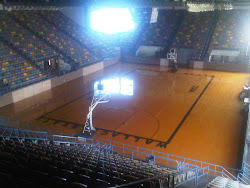 The event was moved to the Wallace State Coliseum in 2009 to accommodate the increased participation. The facility reached near capacity this year, with more than 50 tables and 400 guests. Cespedes said that he and other board members were making it a priority this year to personally visit with area businesses to encourage them to establish scholarships or to support existing scholarships. He announced five new and expanded scholarships this year: the Cullman Savings Bank Scholarship, the FMI-Medical Scholarship for a Machine Tool Technology student, the Fred and Holly Cespedes Scholarship, the Richard Bunis Memorial Scholarship, and additional funding for the Oden Leadership Scholarship. Following the event, Cespedes received an additional $6,000 in Future Foundation pledges. 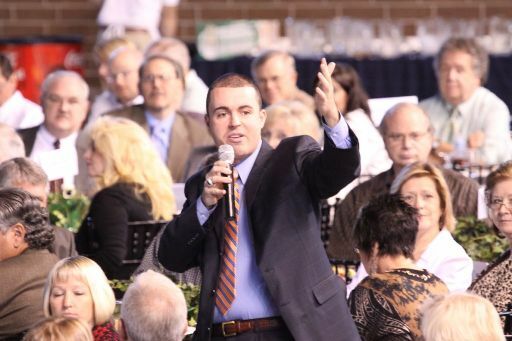 The highest selling item at the auction was a set of four Alabama vs. Auburn football tickets with admission to the Scholarship Club Room, which went for $4,300. Roy Drinkard continued his tradition of winning Gracie Grissom’s pound cake, this time for $3,000. Other auction items included a signed Alabama National Championship game ball, college football tickets, precious jewelry, outdoor furniture and home furnishings, a Green Egg, stainless steel hot oil cooker, first class airline tickets, travel packages, art work, cinema passes, gift cards, baked goods, hunting equipment, a wide array of electronics and techno-gadgets including a laptop, Kindle and iPod, and the like. 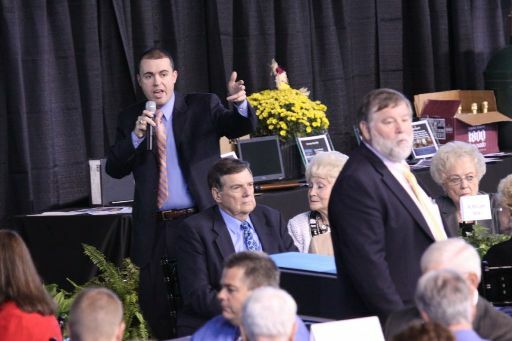 John Meeks, the new Wallace State head men’s basketball coach, made his debut as auctioneer and was a hit with the crowd. The Wallace State Cheerleaders, Singers and Jazz Band, served as wait staff. Those who wish to make an initial or additional contribution to the Wallace State Future Foundation have a number of options. Foundation staff will work with donors on estate planning, setting up scholarships, naming a facility, sponsoring a seat in the Burrow Center Recital Hall, or purchasing an engraved brick at the entrance of the Burrow Center. Donations of any size to existing scholarships are always accepted. Members of the Future Foundation Board of Directors include President Fred Cespedes, Vice-President Gloria Williams, Secretary-Treasurer Phyllis Brewer, Norris Atchley, Evelyn Burrow, Nell Creel, Dale Greer, Donna Guthrie, Betty Leeth Haynes, Joe Holmes, Billy Jackson (Immediate Past President), Dr. Lance Nail, Shirley Quattlebaum, and ex-officio members Dr. Philip Cleveland, and Dr. Vicki Hawsey.